Phnom Ta Mao (Zoo) is located in Tro Pang Sap village, Tro Pang Sap commune, Ba Ti District, Takeo province. Phnom Tamao can be accessible by the National Road No 2 in 40-kilometre distance from Phnom Penh. Then turning right more five kilometers by a trail, it takes 45-minute drive from Phnom Penh. Phnom Ta Mao is a varied site consisting of temples, mountain, nature and a big zoo in Cambodia. Phnom Ta Mao has 2,500-hectar land area called forest-protected area; in this area, the Department of Forestry has taken 1,200-hectar land area for planning trees and 70-hectar land area for organizing zoo. The 70-hectar landarea consisting of five mountains namely: Phnom Ta Mao, Phnom Thmor Dos, Phnom Phdan Poan, Phnom Chhoy and Phnom Bang. Among the five mountains, two mountains have ancient temples are: – Ta Mao Temple (is located at Phnom Ta Mao): was built in 11th century during the reign of the king, Soryak Varman I dedicated to Brahmanism, the temple made of Thmor silt and red-solid brick, located on the peak of 30-meter mountain of Ta Mao, near Ta Mao pagoda. Now, the temple is damaged and is almost unrecognizable. – Thmor Dos Temple (is located at Phnom Thmor Dos): The temple is located on a 35-meter mountain of Thmor Dos, Northwest of Ta Mao temple and was built in 11th century. The temple made of Thmor silt mad red-solid brick. Now, most of the temples are damaged. The people want to go to this temple to worship than Ta Mao temple. 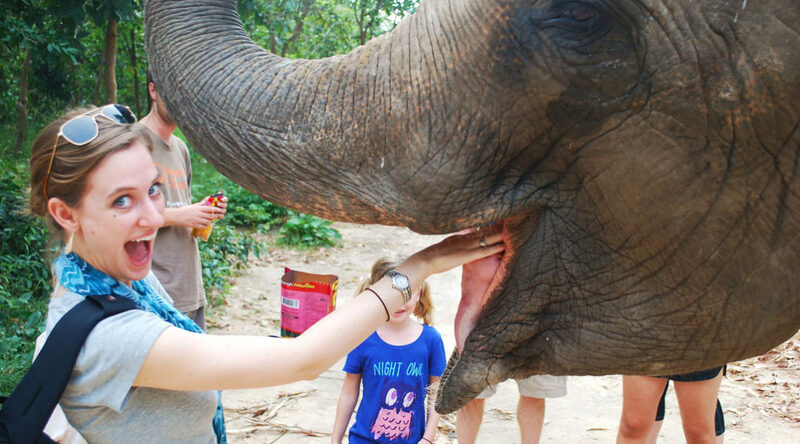 In addition, Phnom Ta Mao has a big zoo in Cambodia; the zoo is under the supervision of the Department of Forestry, Ministry of Agriculture and has 84 varieties of animals and birds; two kinds of them are brought from abroad. – There are 150-fourfooted animals consisting of 38 kinds. – There are 300 birds consisting of 38 kinds. – There are 30 reptiles consisting of eight kinds. All these animals are brought here by the Ministry of Agriculture and by seizing from offenders who illegally traffic in wild animals through out Cambodia. To take care these animals, we need to expend US$ 120 per day for food, and 22 staff and workers are working there. The average number of tourists visiting Phnom Ta Mao is 500-600 visitors per week; but during the festivals, there are 7,000-8,000 visitors per week. The local people of four communes around the Phnom Ta Mao are earning money from selling food to tourists. We can extend package-tour program to the above two resorts because these resorts are the popular sites for local and international tourists, and their location is near Phnom Penh. As the sites can attract many tourists, we expect to lure investors to invest in tourist facilitation and constructing the trail from the national Road No 2 to the resorts. The Department of Forestry has a project on constructing an inside trail linking from Tonle Ba Ti to Phnom Ta Mao in Six-Kilometre distance.